At what point in life did learning become a chore? Perhaps the school classroom is to blame – because let's face it, some of our dullest days were spent there. Remember the sun-bleached course books full of snooze-worthy text, the learn-by-rote lesson notes and the vapid drone of tiresome teachers? If this scene sounds disturbingly familiar, you'd be forgiven for running a mile at the mention of anything remotely 'educational', but don't bolt just yet. Armed with an iOS device and the handful of apps covered over the next few pages, learning something new is about to get not only fun, but also pretty mind-blowing. Granted, there's no magic formula for making something interesting, but with mixed media, interaction and instant feedback at your fingertips, you'll find that topics take on a whole new dimension. Above all, these apps will remind you that the world isn't bound by static lines of print, but is excitingly open-ended – an active universe to be explored, experienced and touched. So come with us for a virtual tour of time and space, history and evolution, spanning micro to macro. You'll spiral down into the human genome and discover the secrets of DNA, and go on to encounter chemical elements in exciting ways you never thought possible. You'll travel through the corridors of history and western art, before skipping round the globe to take in the wildlife and culture of exotic lands. You could turn back the clock to a time before man, when dinosaurs walked the earth – and you can even get to feed them. Or you could simply leave the planet behind, part the clouds and explore the galaxy, without ever leaving the ground. With these apps installed, you'll find answers to questions you never thought to ask, but wish you had. So forget that dusty, drab classroom and think back to an age when curiosity wasn't the exception, but the rule. Time to reclaim that childlike wonder. Your adventure starts here. Imagine if you could hold a window into deep space in your hands; a window granting instant knowledge of the whereabouts of every planet, every star, every system. Now add a wellspring of stellar wisdom founded on the toils of countless men down the annals of human history. Would you pay the price of a pint for that privilege? This is Star Walk, an app sporting spectacular presentation to match its subject matter. Launch it and you open into an ambient soundscape, then up pops a summary box on the state of the solar system, detailing the current lunar phase, day length and the exact angles of the visible planets in relation to you. Tap back the date or dial it forward and the measurements alter accordingly, offering a chronology of the skies. That's some introduction, but this app's just warming up. Tap through to the Star Spotter for a landscape-oriented overview of the sky with control buttons at the screen corners. Here Star Walk drops a database of 8,000 stars onto a photorealistic background of fainter stars and distant nebulae. 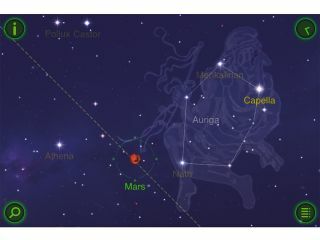 By triangulating your location it positions the star field to fit your perspective. And thanks to one of the most inspired uses of the gyroscope in the iPad 2, it then tracks the stars above you in real time, adjusting to your every move. Star names glide in and out of sight as you physically pan around. Draw down and you can even see star systems below the horizon, marked by a red line. Stunning artistic renditions of the major constellations fade in and out of view as you pinch/unpinch the screen to activate Star Walk's adaptive zoom. All the while satellite tracking unveils space stations as they fly by. Tap on any object and an i button appears; hit it to get in close and peruse a sidebar of astronomical data, along with an explanation (and perhaps even celestial history) of the object in question. The Star Spotter's clock-face button works as an extension of the time machine function seen in the opening summary, enabling you to manipulate time and sky orientation to fit. A tap of the search button plugs you directly into the database for you to explore space by name or label, while the Spotter's menu button offers further fantastic tools. Search a list of significant events in the astronomical calendar (conjunctions, meteor showers, eclipses and so on) and check out the bookmark facility, which lets you take a snapshot of the visible star field to print, save, email or share over Facebook and Twitter. Tap the Home Location option to be shot high above the Earth and look down on your position, then swipe the globe with your finger to switch to anywhere on the planet for an alternative view of the sky. Don't miss your deep-space picture of the day, the infrared night mode, augmented reality view (on latest-gen devices only) and the option to output to a second display. If Vito's app isn't on your iOS device, app-savvy people will ask why. Superbly designed, masterfully executed and visually stunning, Star Walk is an armchair astronomer's dream. And even if you're not an astronomer yet, you soon will be. There's nothing like a good speaker. No, not the type you might see in our kit section, but the kind you're most likely to see at TED. For those still wondering, TED (Technology, Entertainment and Design) is a series of global conferences curated by British entrepreneur Chris Anderson to disseminate 'ideas worth spreading'. The topics range far and wide – anything within the broad remit of tech, science and culture is fair game – and make for hugely rewarding viewing experiences. Unlike the $6,000 sum you'd need to cough up to attend the conference, all online TED talks are free to watch, and this similarly free app acts as a portal to all of them. Swipe through pages of tiles (arranged by most recent or most popular) to pick out a talk, or choose a theme or tag from the access list on the menu bar. Create playlists, save top tags to return to, save videos on your device for offline viewing, or take up suggestions made by the app based on previous viewings. If you don't have time to go browsing for something to watch, hit the Inspire Me button, where you can easily choose talks to fit your mood ('courageous', 'funny', 'jawdropping' and so on) and select a maximum duration. The iPhone app offers AirPlay playback plus TEDRadio for streaming audio talks. Packed with content and regularly updated, TED is a truly inspiring app that your Home screen shouldn't be without. Cast your mind back to chemistry class and those oddly labelled tiles printed on paper and pinned to the lab wall. Back then the elements were drab abstractions met with a comparable level of enthusiasm to multiplication tables and hypothermic mornings in assembly hall. But no more. Fire up this app and you're greeted with a searchable periodic table that never looked so exciting. Stunning 360-degree animated objects act as entry points to each element: tap one for a close-up and instinctively you'll want to reach out and touch it. Accompanying this dazzling show is a breakdown of the element's atomic radius and structure, along with a vertical strip describing its melting and boiling points. Further information on each element is available at the tap of a button, piped in by way of the WolframAlpha computational knowledge engine. How deep would you like to explore each element? Basic thermodynamic and electromagnetic properties are all present and correct, as well as more nuanced mathematical identifiers and reactivity readings. But the standout feature is just another tap away. Switch to screen two of your chosen element for an intriguing narrative on the circumstances surrounding its discovery, notes on its volatility, as well as further objects depicting its material formations, scientific and everyday uses – from Victorian tinctures to chewing gum. Packed with over 500 directly manipulatable 3D rotations, The Elements still delivers the most tangible portal into the constituents that make up our universe, and is a fascinating way to explore what makes up our world. Many of us will have recently watched NASA's space shuttle program gracefully power down to its historic conclusion. Add to that the threat of dwindling investment and you might well think the famous agency is ready to shut up shop. Think again. This impressive new iPad app enables you to follow NASA's broad range of ongoing research activities from week to week. Much like a visually arresting take on a news app, NASA Visualization Explorer delivers the latest news on cutting-edge projects, packaged in a variety of immersive formats. You'll be treated to high-resolution imagery from sources both above and below the skies, as well as video from intrepid explorers of distant lands, all wrapped up with insightful commentary on the subject at hand. Backed up by the power of NASA satellites, you'll expand your understanding of Earth's climate, the solar system and the universe at large. Peruse powerful climatic computer models – once the sole preserve of experts – or check in with polar scientists at base camp Antarctica to monitor one of the world's fastest-moving glaciers. This is a truly spectacular app. Encyclopaedias: not the most exciting of books. And that's a real shame. What if you could take the most interesting bits of knowledge and browse through them in a more visual, engaging way? As luck would have it, Geo Walk HD is a fun little app that does just that. Spin the globe interface and tap a hovering object to zoom into its image card; tap again to reverse the card for a brief commentary on the subject. Use the dock to switch to the carousel card mode or turn on a category filter (architecture, for example). With only 500 objects to discover, Geo Walk certainly won't replace your bookshelf encyclopaedia, but it will make you more likely to casually browse its entries.